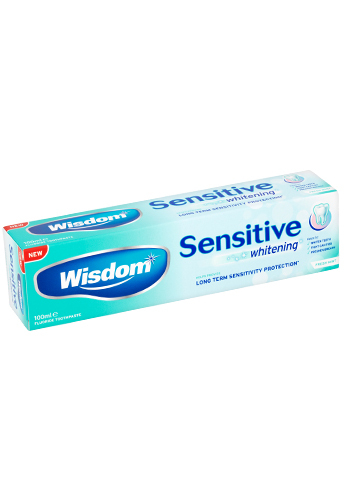 Wisdom Sensitive Whitening has been specially developed for people with sensitive teeth. 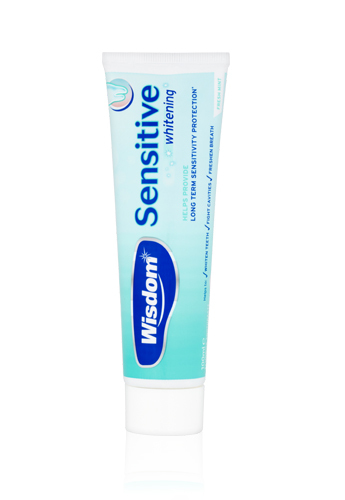 The gentle formula contains Potassium Citrate to help soothe nerve ending in exposed dentin and provide relief from tooth sensitivity, whilst added stain removing ingredients help to whiten teeth. Ingredients: Aqua, Sorbitol, Hydrated Silica, Potassium Citrate, Sodium Lauryl Sulfate, Aroma, Cellulose Gum, Potassium Sorbate, Sodium Benzoate, Sodium Fluoride, Sodium Saccharin, Sodium Hydroxide, Limonene, Cl 77891. Not suitable for children. In case of intake of fluoride from other sources consult a dentist or doctor.